Happy New Year, everyone!! I don’t know about you, but I’m looking forward to a wonderful, expanding, fun and yarn-filled year. I’m sure I’m not the only one that is happy to see the backside of 2017! My resolutions this year are to be more productive (try to finish some of my WIPs – works in progress) and be more organized. I don’t know about you, but MY craft areas need a major overhaul. The yarn is taking over!! What are your resolutions this year?? January is an exciting time…with frosty weather, snow days, and evenings crafting on the sofa, watching Netflix, and drinking hot tea. This dead of winter is a perfect time to start on cozy projects for yourself, now that the Christmas crafting is complete! I see many knit shawls in my future….I just LOVE a warm scarf to snuggle into. We are back to being closed on Mondays, and will be open regular hours, Tues through Sat 9:30am – 4:30pm. Several yarns are on clearance for 20% off to make room for new product. Come see the table in the shop, piled high with goodies! – Select colours of Bernat Pop! So exciting! I am preparing to choose a pattern to test-knit for our first IKYS Knit Along!! If you have never heard of a knit along, you’re in luck! Over the course of 3-8 weeks (depending on the project), we will knit a pattern together. The pre-tested pattern will either be provided by myself or linked to an online pattern, and appropriate yarn will be made available in the shop for purchase. Every week we will have an in-shop get-together to knit and help each other with the project (with phone or Facebook troubleshooting available if you can’t make it in) and at the end of the Knit Along, we will upload photos to the Facebook page and someone who has completed the project will win a prize! This is great way to start (and finish) a project, and get assistance on a tested pattern. I’m leaning towards a cowl or shawl project….but if you have any recommendations or requests for it, please contact me at the shop soon! Having problems with reading a pattern? Can’t remember how to fix a mistake in your knitting? Every other Tuesday, Helen will be available from 1 to 3pm for our free drop-in Knitting 911 at the shop. Bring in your project or questions on January 9th & 23rd. January 20th: Basic Sock Knitting – Helen Hicks teaches the basics of sock knitting two at a time, on circular needles. The benefit of this method is finishing a pair at the same time and only having to count rows once! We will be knitting with worsted weight yarn over three weeks, in 1 1/2 hour classes, starting Saturday, Jan 20th at 10:30am. Cost is $89 +tax. Supplies can be purchased in store with a 10% discount when you are registered. Basic knitting skills are required. 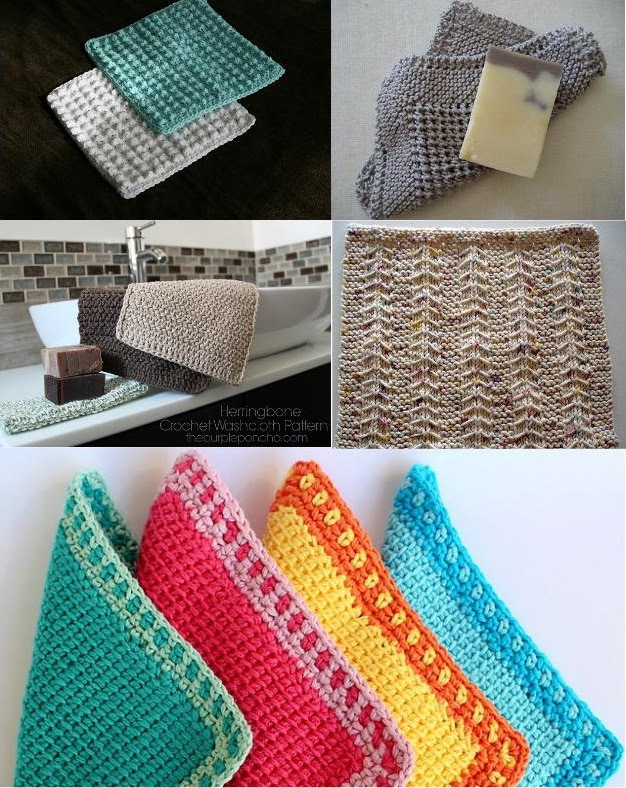 The staple, quick-finish or travel project for many of us knitters or chrocheters…the humble washcloth! A giant, fluffy stack always makes a great gift, and you can never have enough of them around the house for your own use. But there are so many more patterns than the basic diagonal knit cloth or the basic crochet cloth. Challenge yourself to try something new! A new take on diagonal knit with the Diagonal Knit Dishcloth (on Ravelry) by Jana Trent. A nice, textured center for extra scrubbing power. The Herringbone Crochet Washcloth on The Purple Poncho. I love to make these a bit smaller, and then add a double crochet border in another colour! The knitted Little Tent Dishcloth by Vaunda Rae Giberson (via the Wayback Machine). There are rows of diagonal slipped stitches, giving some interesting texture – such a beautiful cloth. The Nubbie Scrubby crochet cloth pattern by Angelie Marie. An amazing, bumpy texture and can be used as a washcloth or a dishcloth. At the Impossible Knot, we have a large selection of Lily’s Sugar n’ Cream cotton in a variety of ball sizes, as well as a selection of Red Heart Scrubby yarn.